Patch 007 released, onward and upwards! Worked on doing some improved boost simulation, still no where realistic. But it's a ton better, worked on sounds as well turns out I somehow overwrote all V8 engine sounds in patch 006 with the some horrifyingly clipped stock sound. However I never noticed it as my test version wasn't using these. Toned down induction sounds massively, and that is pretty much it. Fixed now, on track to hopefully release patch 007 today or tomorrow morning. Attempting some sound adjustments, replaced the diesel engine sounds with much better ones, corrected sampling levels. Attempting to work in some limited boost simulation for patch 007 which I can tie into sounds. However did have some setbacks, and odd issues that forced me to start over from scratch pretty much. Boost gauge now functions, and has some limited simulation but it's tied to throttle position only so obviously it's not quite there. Patch 007 testing phase, and screenshot contest! Working on testing of the next patch, and more website work regarding the re-launch of 4x4evolution.com. Lot of work to do, and no free time to work it, next patch should be out soon. Glanced into adding BBA/LAN support for the DC version, just don't have the time to port the KOS drivers over currently. On the topic of re-launching 4x4evolution.com besides just linking to this bland developers log, and in the spirit of keeping this project community driven I want to feature a community screenshot. Theme: "Go anywhere, build anything!" What: Anything in game, or editor. Can have minor photoshopping, but it must be an accurate representation of the game. Preparing to release the next patch, just have some more tweaking to do, and have been working on minor physics updates to address some low-speed handling issues. This time we can offer direct downloads, so prepare to say good bye to torrents as the primary distribution method. 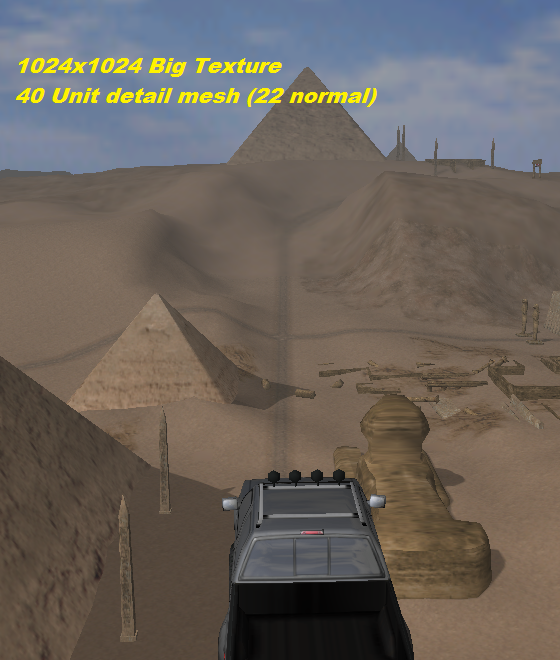 Also got Jeep Evo tracks functioning in game, though not quite perfectly yet, not sure if it will be in next patch. Got the classic MTM2 map Zoon Moon loading, there are still some graphics related issues to sort. But almost all MTM2 maps should be 100% supported now! Still need to address a few texturing issues, but it's getting there. REALfreaky has been hard at work with getting winch lines visible online, and some background improvements as well that's about it for now. Still working on this aspect of it, just haven't had enough free time to sort the below issues. Got the epic MTM2 track "Zoon Coaster" running last night, with yet another new bug of all models just disappearing when looking at a certain but still unknown model that's causing problems. -Transparent textures used in MTM2 are not transparent. All in all, the list of custom tracks that work with 4x4Evo just got considerably larger by a few thousand tracks potentially. Looked into sorting a bug that caused vehicles to "crabwalk" at low speeds, this was especially noted on lighter trucks. This is due to the way inertia is calculated. In a way it almost seems to work backwards, some minor tweaks today fixed this up However, it needs some more play-testing to find that right balance of a true simulation, and 4x4 Evo physics. Also work on getting an editor package put together for public release has started after a good deal of delay. And found some other areas to improve on as well, overall good progress today. Evo 1 LTE support improvements. Sorted the issue with the terrain floating in the sky, and disabled the "BigVis" system when you play older Evo1 LITE maps. This fixes the floating ground, and tree issues. Progress is a bit slow sorting bugs before mess with the editor, but necessary regardless. "Culb" has still been hard at work and added notifications to the chat room, allowing you to idle yet not have 4x4Evo take up the entire screen. 4x4evolution.com is back, this is a big deal! Why is this a big deal, this means non-patched players can now play the game once more! Further more, hopefully this can become a central hub for all things 4x4 Evo in the future. Also added options in the graphics menus to add bump mapped water, and disable Evo 1 Fallback dirt. "Culb" is still working on multiplayer UI additions as well. Removed an outdated API call with the help of "KMaster" over at MTM2.com, this may cause issues with anyone still running Windows 9x. "Culb" has handled a few improvements on the multiplayer chat side. And I've been working on adding options for those that might be so much a fan of the new options, and backwards compatibility. Unfortunately, I just have not had time to do a lot this week. Believe for the most part all upgrades are now complete, and most everything has made the switch. Now to get back to work on updating the editor. Been working on a major update, mostly so I'm not making this all work via a Windows 98 Virtual machine. While it does work, finding bugs is cumbersome to say the least. In other progress, added a toggle for classic Evo engine sounds should the new ones be unwelcome. Attemping to sort a startup crash for someone that appears to be specifically related to Evo 1,2, and another of the same era. Once this is sorted work will begin on the editor. This patch is to fix an oversight when the rear tire model is loaded. Apparently patch 006 broke compatibility with large majority of custom trucks as there are two ways to name tires. Also fixed a few minor bugs as well! Download it HERE! NOTE: YOU MUST INSTALL PATCH 006 BEFORE THIS PATCH! 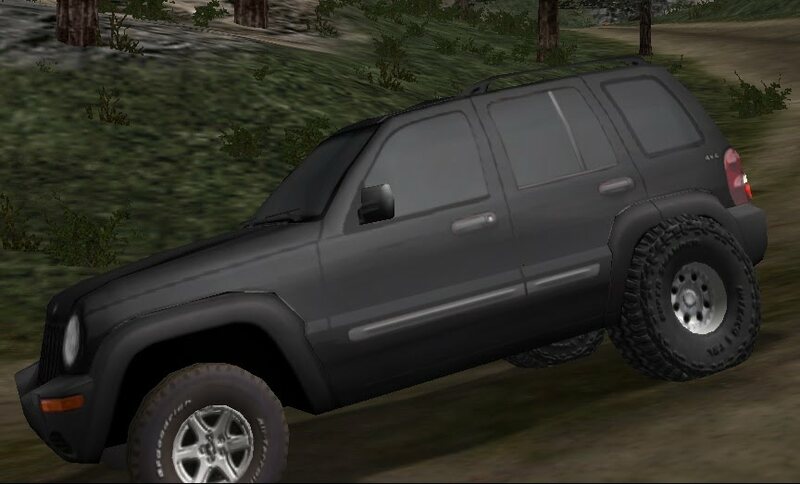 -Fixed broken tire model name bug on tires labeled L & R.
-4x4 Evo 1, and all trucks without dirt textures. -Rear tires collect dirt again. Newest patch is now available! Get it from the 4x4 Evo 2 downloads section or CLICK HERE! Note: Due to the size of this patch, a torrent client will be needed I don't have the space for this file currently to provide it directly. -Added higher detail truck option. -Reverted ground detail change until I figure out why it's messing up detail texture placement. -Discovered support of MP3 files. Left unused for now, not helpful at the moment. -Major amount of work to engine audio system, provisions are now in place for alternate engine sounds. -Fixed background art scaling to different aspect ratios. -Added wheel friction according to surface you are on. -Evo 1 Trucks now backwards compatible, notify me of any bugs!!! -Added traction control, NOTE it does work, but dash overlay is not fixed. -Built in POD file management. -Added a poorly done hack to reduce Framerate/CPU use while racing. -4,6,8 cylinder, and diesel engine sounds. -Evo 1 Dreamcast patched truck corrections still not in the patch. FPS reduction, and some other stuff. -idleSpeed is not working at all times. Hello built in POD manager! In an effort to make the game more user friendly, there is now a built in POD file manager. Not enough free time to do much else. Dash overlay work, first offical pic of a true dually. Worked on sorting a lot of the dash today. Not much else to say there, boring little details really. Also here is the first official shot of a new truck using the updated features, courtesy of BigDOGGe over at Vales.com. Of course with new updates comes more bugs, and delays as well. Idle speed, diesel sound provisions. More version 9 .trk updates. Put in entries for idle speed, and fuel type. This is more geared towards people who want more diesel entries in the game. Fuel type will strictly used to handle sound types, still need to create or find the diesel sounds. Ended up simplifying how TCS works, so it's vaguely functional in the same way it is on modern "offroaders". Basically it will lock/unlock the diffs, and cycle them 5 on/off 5 times a second when wheel slip occurs. I may add a braking penality later on for a more realistic behavior. Added more .trk Version 9 items, finally. Fun Fact: Maximum suspension travel allowed is 2 units, anymore has no effect. It's functioning, however until I have a better way to manage when it should trigger, I'll likely leave the TCS indicator disabled. Also realized that I forgot to do the digital dash for the status gauges. Doh! Fun Fact: Regardless what you put in your .trk file. The highest axle angle that can have any impact is 0.5, anything higher has no impact. The boring and non-exciting part, testing all new additions to ensure they work, fixing the little details. Still a bit to do, but it's getting there. Fun Fact: Got nothing for today, back to work! Multiple wheel models per truck! Version 9 .trk support is now in the progress of being created. So far all it adds is automatic transmission ratios, and separate models for front and rear axles. By far the most visually notable change yet, this might not make it into the Dreamcast version due to the lack of RAM. Fun Fact: There is backwards compatibility for all formats of .trk files. Including versions 1 through 5. However with the format information not publicly available, it makes it near impossible to figure out. Haven't had the time to do much work this weekend. Would like to take a moment to thank RageFit over at Vales.com, for suggesting the idea of wheel spacers as a in-game part. This is a tiny thing that will offer a good deal of variation for near as close to no effort/time to implement. Brilliant thinking! -AWD vehicles with a transfer ratio of 1.0f can not select 4WD Low. 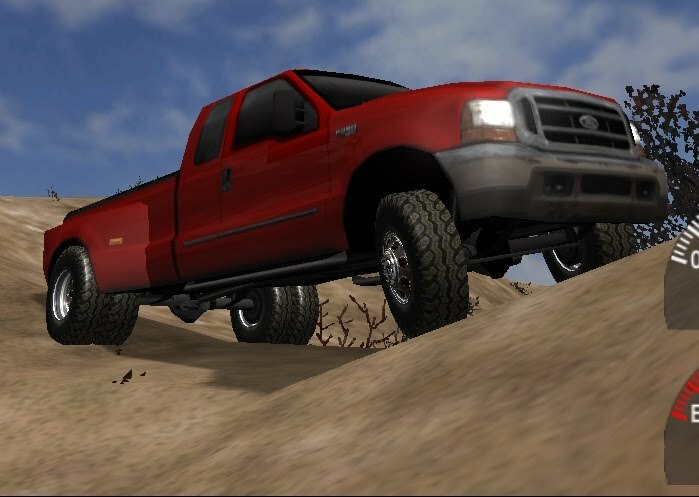 -4x4 Evolution 1 trucks are now backwards compatible, but still fighting some texture alignment issues. This may not be in patch 6. Fun Fact: One of the hidden/unused items in this game is a lowering kit. While it likely won't help off the beaten path, it may help on smoother tracks. Research spilled over a bit now, Bumped up life of smoke, plan is to change it based on the terrain type. Attempted to raise maximum vehicle count over 8, but met with memory allocation issues. Ultimately failing upon pulling textures for the 9th truck, may just leave it at 8 players for now. Going to work on some bug fixes, high-res texture testing, and a new .trk file version to introduce new features. Hopefully I'll have this patch set for release this week depending how things play out. Fun Fact: Birds only appear during daytime on the Dreamcast version. Spent the days work doing more research on various aspects of the game. Didn't really accomplish too much useful, can create/clone .LTEs now in the editor. But it will crash upon creating new course objects currently, more work needed there. Added surface based friction, turned out to be too effective on the first test, made for a good laugh. Need to setup particle effects for mud as well. -Engine sounds now switch based on engine type, and aspiration. The sound part is easily taking most of my time up. definitely needs a lot of tweaking still, likely only 4,6,8 cylinder, supercharger, and turbo whistle will be in this patch with placeholders so that someone else might be able to pick up the slack on the rest. Fun Fact: Today's fun fact is brought to you by nfsgeeeek at vales, the Gamecube version of Evo 2 has extra content that never made it into the PC version. Including several tracks, a few trucks, and some additional features as well. Not much time to work on it today. Still need some better sound samples, and work on implementing new sounds. Worked on creating some new engine sound loops. Worked out how to handle manifold pressure (boost) simulation. Should be a nice auditory treat for the next patch. Fun Fact: When viewing Jeep Wranglers for sale the legs are part of the model, and have to be hidden. This is applied to any truck with the model name Wrangler specified in the .trk file, and the correct polygon grouping. Completed the setup of the gauges, so that they can be "plugged-in" once I simulate those bits. Bumped up the maximum dust cloud limit from 200 to 1000. Otherwise, not much else to note. Oil Pressure = Engine status, will be used to handle damage once added. Water Temp = Tie into the light damage, fuel consumption, possibly engine damage as well. Fuel = Should be obvious. Fun Fact: Jeep Evolution had diff locks that could be toggled. Beginning of First New Gameplay Elements. Completed the art for additional vehicle gauges, they are not tied to anything just yet but will be next patch. Progress! Fun Fact: Evo 1 actually generates the gauges based on the vehicle's attributes (Redline), whereas Evo 2 has all gauge variations stored in your startup.pod. Started work on adding some new gauges, for some additional features that I hope to have in the next patch. Found more hidden goodies. Looks like Evo 1, and Evo 2 both had MP3 support this whole time. However the current implementation isn't all too useful at the moment and was not used at retail anyways. I'm not sure I'll be doing much with this but here it is. -Massively better file size to quality ratio. -Can not be over 2.5MB from the looks of it. .WAV files don't have this limit as it will stream over this point. -As it can not stream it (currently), it has to load, decode, and save it to memory. For small files it's not an issue, but this adds considerable time to something like say menu background music. Like 5 to 10 second delays for a music change on a 2MB MP3, vs near instant on any size WAV. Fun Fact: Evo1 & 2 both support MP3 files! Added new vehicle detail level "high" today, it basically bypasses all detail checks and renders all trucks in high detail. Spent the entire day trying to figure out why detail textures aren't applying with higher detail distance settings. It's not hitting the limits for it, so I'm at a loss and will need to break down how it works tomorrow. Also added in missing camera angles, turned out to be the easy part of the day. That said Dreamcast updates are still planned, pending an updated editor that will allow processing of DC track/model files. Fun Fact: The console releases use a slightly different approach to models, instead using a format called .SMB it actaully works exactly the same. However it's written in a binary format, likely to save space and speed loading times. However it is a one for one of your standard .SMF it just isn't understandable to the naked eye. Thanks to Best_Apple over at Vales.com for coming up with a design for the site logo. It's a nice improvement overall. NOTE: IF YOU DOWNLOADED PATCH 005, PLEASE DOWNLOAD PATCH 005A FROM THE DOWNLOAD SECTION. THIS FIXES A MULTIPLAYER CONNECT BUG!!! Fun Fact: Today's fun fact is a tire traction chart! Evo 2 Update 5 is out! Evo 2 patch number 5 is now available for download! -Removed 640x360 resolution, it was breaking the 16:9 resolution options. Fun Fact: Deep cut tires perform best on mud, gravel, sand, and rock. Back to where I was a few days ago. Made some corrections to the aspect ratio option in the launch menus. Certain circumstances could cause this to go out of sync, and as a result would cause menu flicker/sizing issues (Note the art is still not adjusted yet). This should fix it for good this time, going to work on generating 1024x1024 big textures for all stock tracks today as well. Fun Fact: The item eng.redlineTimer in the truck file actually pertains to vehicle engine damage, specifically how long you can run the engine over it's redline before it blows. However, it was never implemented in the release versions. I need to sort out some sort of error reporting on the DC version, or find someone with a devkit. Progress is slow on that front, but for the 3 people in the world who still play it, they will love it. seriously though if someone has a devkit let me know, might have something big for the DC community. Fun Fact: Jeep Evo 2 and the mod 4x4 Revolution both had the winch enabled for online use. Have not had too much time these past few days. Worked a bit on compiling a bug list, and some minor work on getting a new version of the editor out. Fun Fact: Snow weather actually has multiple subtile effects, besides the reduction in traction, it also makes the water solid like ice. Working on adding in missing Evo 2 parts, and adjusting price to match reality and not so much for play balance. Also attempted to increase the distance mesh can only get it up to 40 units, anything beyond that is causing the vertex buffer to go wonky. Not sure why or if I can even figure it out honestly. But hell, an improvement is an improvement check out the newest pic! Fun Fact: Evo 1 actually had digital gauges, but it could not be selected. They only were used automatically at any software resolution below 640x480. Also to prevent confusion I removed the original patch from the downloads. There is no need to run a http server as a half-sorted fix anymore. Fun fact: The PS2 version using the same quality 256x256 distance texture as the PC version, and one 1024x1024 medium distance texture. However the XBOX version used a 1024x1024 texture at distance, and a 2048x2048 texture at medium distances. These textures are a low-resolution snapshot of the entire map that appear to be used to improve performance, and in a way reduce the use of mipmaps. Played around with some texture replacement. While I don't have a full implementation of it yet, I replaced the standard 64x64 textures with 256x256 textures, and to my surprise it auto-scales it and easily co-exists. Below is an example, has the potential easily make the game look better. Fun Fact: Evo2 was always able to support .LTE tracks. However due to differing file names, the inability to add them through the startup menu, and the fact very few Evo 1 maps worked with it among other bugs made almost completely unused. Apparently I made a small goof in re-sizing the UI to stop flicker. The current workaround is to change the aspect ratio option before you start the game it will stop it for now. Next release will have this fixed. Fun Fact: Jeep Evolution had an additional update to it's .trk files that wasn't in 4x4Evo2. This was the inclusion of separate gear ratios for automatic transmissions. 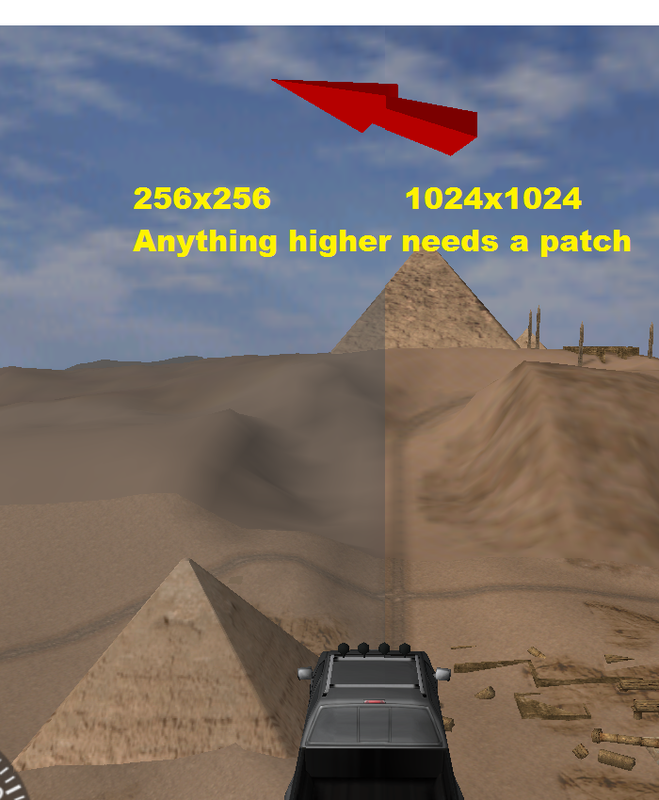 4x4 Evolution 2 Patch 004 is live! -Added aspect ratio option in the startup menus. -Disabled RAM warning, if you have less than 32MB of RAM it's time to upgrade. -Disabled swap file warning, just doesn't work on newer OSes it seems. -Enabled snow collecting on tiles. -Changed sim speed modifier from 125% to 100% for added realism. -Re-enabled software mode, not that there was a need to. Wanted to see if it worked. Fun Fact: Evo 2 also had its share of unused parts. Such as a lowering kit, traction control system, additional race spring settings, and installable limited slip diffs. Back and with tons of updates in store! Finally figured out how to generate DC track files, just need to do a test burn. Metric ton of updates to Evo2 getting it ever closer to surpassing 4x4Revo. A few to Evo 1, and with some helpful people from vales I can now incorperate some Jeep Evo 2 updates as well, though that will have to wait a tad longer. With a bit more testing I should have all 3 versions up by the weekend. Fun Fact: The prototype suspension in Evo 2 only bumped up vehicle traction, beyond that it did not improve suspension travel. Evo 2 patch is now available for download! Fun Fact: A number of parts were never added to parts.POD but made the final cut into Evo 1/ DC. Items such as 44" tires, snorkels, and longer travel suspension. Still working on the DC, and Evo 2 side of things but, a new Evo 1 patch is live! Fun Fact: Any 2WD vehicle can be made 4WD, simply purchase a race transfer case. The downside, usually you have no low range. The upside, less weight! More patching Evo 1 & DC. Progress is slow, but still working on more behind the scenes work, but not much to report. Added new settings to metal.ini to allow direct connections to chat servers in the event a master server can't be found without the need for the half-assed host a http server fix I posted up before, fixed the menu the correct way, edited the manufacturers on half the vehicles (again. ), and a correct resolution patch. Fun fact: By the default the winch on 4x4 Evo 1 literally does nothing, besides slow you down. How much does it slow you down? 15 lbs, and a bit of aero dynamic drag is added. But hey at least it looks pretty! Today's progress; removed the requirement to use an HTTP server to think the game is online,. Still a ways off from the next update on Evo 1 PC/DC, but it will be big. Also figured I'd start posting up random bits of little known info on the game. Fun fact: While Evo 1 ditched the visible damage that was in MTM, it does still apply to vehicle lighting on night races if you do not install a brush guard. Resulting in massively reduced lighting. Have a ton of work to do, but full-on custom maps for the DC look to be a go and possibly more. Might be a few days before this is truly ready, but it will be worthwhile. More obstacles on the DC front. Still haven't given up just yet, but still have had no luck even loading a map with partial changes. The error messages are all there in the executable, but I don't know of any way to obtain them (Could hook up an oscilloscope to the serial port, see if it dumps there or they could just all be switched off). Might still be some hope depending on how the next few days pan out, for now I'm poking around in a hexeditor to see if I can find anything else of use. Updated the texture for the aftermarket wheels to a contemporary wheel and tread pattern. Still needs some touching up, also gathered some more vehicles for use in game. Bunch more work to do before the next update is uploaded, really want to get at least some limited track support added in. Turns out there is a minor difference in how the PC & DC version handles truck strings in the executable. Oddly the DC version is the more flexable of the two, can't say the same for the PC version. Basically this means that I need to rename most of the trucks yet again, as I want to sync up the PC and DC versions of 4x4 Evo 1 for the purpose of multiplayer. -Added series events from 4x4 Evo 2, minus the tracks specific to it. -Fixed bug with a single blazer that I forgot to change the manufacturer on. -While 8 starting points are there, loading more than 4 players always crashes the game. -.SMB files do not seem to be used for trucks. But do seem to be used for every other model. Will have to test to see if it's falls back to .SMF when SMB's aren't available. If not a converter will be needed. Been having one heck of a time with file formats, and getting custom tracks in. The biggest hurdle being that you can't obtain any error messages from the game, and any error reboots the machine. I also can not find any method to read LTE maps direct from the CD, as the methods used for loading are also not shared with the PC version. Decoding the .DC file fully is beyond my capability so it appears. Best I can figure is that they are stored as uncompressed twiddled PVR textures minus all header information, and at half the resolution (32x32 pixels) of the PC version. The biggest problem being as I don't understand how the process works. Looks like I was wrong about how it stores data for tracks. Refered to some PVR texture information and it would appear that the textures are usually a 16-bit format. Looks like the .DC file stores the track textures as RGB565 instead. Holding up to a maximum of 2048KB of textures. The order is a bit screwy though, haven't got figured it out. Not much more to say there, report back any bugs, Try it out, hopefully I can figure out how they stored the textures in the DC, DC2, and DC3 so I can get tracks loaded in. Looks nothing like the formats normally used for the game, almost seems like some sort compression or a completely different format was used on them. Ninety-nine coasters of discs on the wall. Burned roughly 20+ coasters today, and 3 successful burns. Turns out my laptop is having some difficulties finalizing discs, finally though got a successful burn so I can ensure with 100% certainty that the updates work on real hardware. Should be uploading a torrent tomorrow once I have time. Quite literally went through and edited every single truck in the Dreamcast version, made a massive amount of corrections. So many in-fact that I have to post them all on a separate page, hoping to do a test burn tonight to check for bugs. 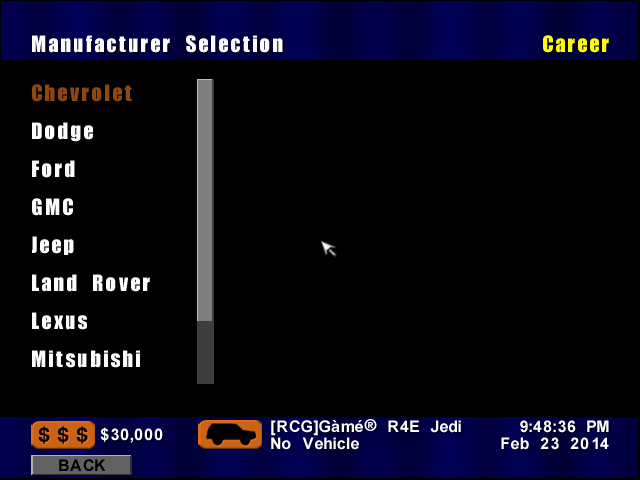 Also patched in the dctalk server correctly I hope, and added a proper sales category for Jeep. Looks like I can resume modding the DC version, scored a free DC from a friend in unknown condition. And turns out it works beautifully despite being a bit dirty. This will be second in line after I complete work on the sound mod for the PC version. Sound work, did a bit more work with sounds need to figure out how much it scales engine pitch as it travels as I am not quite happy with how it sounds in the upper RPMs. Other issue is it loads the strings for the sounds in different memory addresses each time, will have to figure out a consistent way to get it the first time, every time. Only issue I have is the current method I am using to replace the sound sometime misses the narrow timeframe to replace it. As a result it will end up loading the stock sounds, think I have a solution but that will have to wait for now. As a proof of concept it does work beautifully otherwise. Dreamcast on hold. More updates for 4x4 Revolution. Until I either fix or find a replacement Dreamcast I'll put updates on hold for now for that platform. Instead I'll direct my attention to 4x4 Revolution, this mod of Evo 2 actually had quite a bit added into it. While it doesn't have the elements that Jeep Evo had, it had some nice additions, and patched a few things. Hexediting is quite time consuming and has a lot of limitations, and lacking the ability to modify the program directly I'll work from the outside. If you have ever used a game trainer, this will work in a similar way looking at memory values. From there using those values it can modify the games behavior. -.trk files contain a line called eng.type. -By reading this value we can swap out the engine sounds used while the game is running. -Loading say the RAV4 returns a value of 3, letting the trainer know it has a I-4. Translating PC formats to Dreamcast formats. It would appear that in the interest of saving space/speeding up load times, they store all models in a different format called .SMB. For the most part it's similar to .SMF files however instead of being easily readable to the human eye it's just saved as raw data which takes up considerably less space. One thing that is confusing is that the original model files are there for the trucks, but I'm thinking they are just leftovers from the PC version. The awesome thing is that means there is tons of space for additional content. Looks like a file converter if needed will be easy to create. Texture data will need a bit more work to sort out however. 4x4 Evolution 2 Update 002 is live! Also successfully repacked a self-boot 4x4 Evo Image for the Dreamcast finally if tests via emulator are any indication. However I can't go beyond the load screen via emulator sadly, I see many a coaster being burned in my future once I get my Dreamcast running again. Dreamcast broken, file for MP fix taken down. Turns out the years of storage for my Dreamcast have not been kind. Will have to attempt laser adjustments later, But currently it can't read any discs, also with some experimenting it looks like the attempt to modify the ISO was a failure as it listed the boot file as corrupt. For the time being I took the torrent down as it would appear it may be broken until I can validate that it does indeed work. Self-booting a WinCE game apparently is a bit of a dark art so it would seem. Once I do get it fixed, and I can test I'll re-upload hopefully with some extra tracks installed to reduce the need for VMU downloads. 4x4 Evolution 2, Full .LTE Support! Turned out to be way easier than I expected to fix, basically just combined the .POD files from Evo 1 & Evo 2, and voila .LTE maps successfully load. Then for the cherry on top, it turns out it was very easy to fix the custom tracks listing via a minor bit of hex editing. I will hopefully soon be posting up a patch as well as the offsets as well. The full .LTE patch is rather large @ 72MB it includes a second update to the executable and will likely need to be distributed via torrent as well. Planning to do the same thing to 4x4 Revolution as well, given that it has some nice additions that could really improve the game. Yet it would seem progress on it stopped before it could be realized. EDIT: Turns out 4x4 Revo put this in originally, and a much lighter weight. So I'll be adding those in, and providing the appropriate credit to those responsible. Made similar but untested modifications to the Dreamcast version of the game, however there is no way to eliminate the need for master server. For it now automatically points to dctalk removing the need to change DNS settings should you burn a copy. Should be online on most major torrent sites if someone does happen to test it before I can let me know. Did find some fun settings to play with that aren't on the PC version, will have to burn a disc and give it a go. Modified 4x4 Evo 2 executable is now available for upload. As there is only one chat server operating that I'm aware of, you may need to verify what version they are playing. Did some work on the 4x4 Evo 2 executable, and have accomplished the same exact localhost patch. Seems as if the chatroom functionality is the same, and actually achieves a goal I wanted to accomplish years ago which was merging the chatrooms of 4x4 Evo 1 & 2, if I recall from years ago the multiplayer was compatible (Besides obvious physics differences) . And while .lte support was mostly broken in Evo 2 it does still work. Some mass renaming of files should actually allow most LITE tracks to work as well. Attempted to increase the draw distance, while the menu option can be changed. Any attempts to move the slider over 40 units results in a crash. Likely due to not enough memory being allocated, sadly I do not know of any way to address this through a hex-editor. The offset has been added, though I don't see it being of much use currently. Completed an updated skybox model, and greatly reduced pixelation. 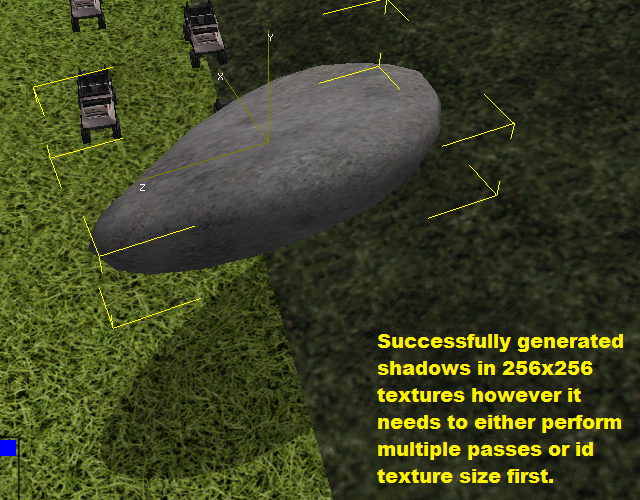 At the expense of redundant detail, I'm currently unable to add screenshot as I can't take screenshots in OpenGL Mode. However I am adding the POD file for download. It only affects Crazy 2000, Construction Junction, and all .LTE tracks based off of them currently. Released an update to the 4x4Evo executable. This eliminates all dependency on the now defunct 4x4Evolution.com to connect to a chat server. This update also adds some widescreen resolutions to the game as well, making it a bit more functional on some modern hardware. All offsets have been added to the offset page.